Concrete repair regardless of the temperature. Concrete repair in cold storage facilities used to mean shutting down to raise the temperature most concrete repair products require for usage. Not with Commercial Concrete Solutions’ products and processes, which work at -20 degrees. When bumps and hits from forklifts and equipment happen, the damage leads to hazardous conditions that put employee safety and product quality at risk. Employees face trips and falls. Products can fall off forklifts operating on uneven surfaces. With CCS, quickly repair concrete surfaces in the coldest conditions and return to service in as few as 15 minutes after the repair is complete. Concrete surfaces at Nor-Am Cold Storage take their fair share of abuse, and considering the frigid temperatures inside, replacing them is impossible without effecting operations. Traditional concrete replacement isn’t effective or recommended at cold temperatures. And, cold patch doesn’t last. Nor-Am Cold Storage had concerns with cracks and spalls on their flooring and contacted CCS to repair them. 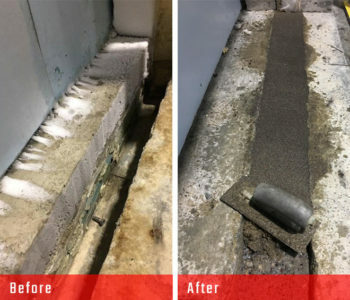 In less than a day and without muss or fuss, CCS repaired each crack and spall on this refrigerated cold storage industrial flooring, which eliminated trip hazards lessened wear and tear on equipment.